We kick off our coverage of SXSW 2012 right here. Join us! 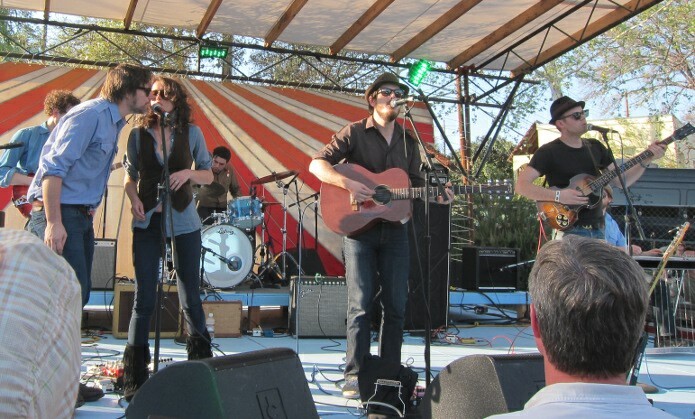 Jon Irion and Sarah Lee Guthrie (left) join Vetiver at 2011's South by San Jose fest. Jay-Z – Sponsored by American Express and YouTube, Jay’s concert will be streamed live on Monday, March 12, at 7 p.m. CDT. Here is the link. Go early and Tweet your request, maybe he’ll play it live. Here is another link. Bruce Springsteen – His keynote speech will be streamed live on Thursday, March 15, at noon CDT. The entire event will be available at NPR Music, via the NPR Music iPhone and iPad apps and at SXSW.com. The NPR Music broadcast will also air on many public radio stations across the country, including WXPN Philadelphia and WFUV New York (check local listings). NPR Music critic Ann Powers will host a blog during the keynote, and will take questions from audiences around the world. Warner Music Showcases – Warner Music and Nikon will stream SXSW showcases at La Zona Rosa for three consecutive nights at 7:30 p.m. CDT starting on Tuesday, March 13. Headliners on Tuesday include Santigold and Chuckie; Dr. John and Gary Clark Jr. on Wednesday; and T.I. and B.o.B on Thursday. Go to The Warner Sound captured by Nikon site for updates. The Fader Fort – One of SXSW’s most popular side parties, the Fader Fort will feature 50 Cent, Santigold, Big K.R.I.T. and many more. Fuse TV will stream music from The Fader Fort Wednesday through Saturday March 14-17 . Go to the link for the complete lineup. Mess With Texas – Just a stone’s throw from Fader Fort, the Mess With Texas party is another very popular unofficial SXSW event, featuring alternative/punk/rock acts. Vans and Stickam.com will stream daily select sets live Thursday-Saturday at the Mess With Texas official website. Among the artists planned to perform are Built To Spill, ASAP Rocky and Cults (check the site for schedule). South by San Jose – One of our favorite unofficial side parties, this year’s event features Alejandro Escovedo, the Alabama Shakes, Billy Joe Shaver and more. Check the schedule here then go to Radio Free Texas and listen (requires a free registration). Daytrotter Sessions – As part of its 6th birthday celebration, the great Daytrotter has a full roster of streaming sessions with artists including the Counting Crows, Jimmy Cliff, Delta Spirit, Jenny O, of Montreal and more. Click here to see a full schedule and listen. KGSR Live Morning Broadcasts – The hip-cool Austin station will commence its live morning broadcasts at 6:30 a.m. CDT Wednesday-Friday, and 8 a.m. on Saturday. This year’s lineup includes Kat Edmonson, Tom Morello, Bob Schneider, Delta Spirit, Ingrid Michaelson and more. Check the complete lineup here and listen live to KGSR from its home page. You can also play music from a bunch of SXSW artists here. Waterloo Records– Austin’s coolest independent record store sets up a big stage in its parking lot and lets fly with great in-stores all during SXSW. This year’s performers include Jimmy Cliff, The Little Willies (with Norah Jones), Chuck Prophet, Ruthie Foster and more. The fun begins Wednesday, check the lineup and the live stream at the Waterloo official website. Orchestral Maneuovres in the Dark in Mellow Johnny's Bike Shop. KEXP Live – Another one of our favorites, the Seattle radio station does its live shows in Lance Armstrong’s Mellow Johnny’s Bike Shop. This year’s performers include Howler, Of Monsters and Men, Shearwater, Youth Lagoon and others. Check out the lineup and tune in Wednesday-Friday at the KEXP Blog. KUT Morning “Live at the Four Seasons” – The radio station of choice for many Austinites, KUT-FM will feature 30-minute sets from the likes of Justin Townes Earle, Ray Wylie Hubbard, and others with only two names. They go Wednesday-Friday at 7 a.m. CDT, and 8 a.m. Saturday. Check the schedule here; KUT’s complete SXSW coverage schedule is here. To listen live at any time, just mosey on over to the KUT official home page. NPR Live Showcases – Yeah, NPR again – this time they will stream live Wednesday and Thursday nights. Wednesday’s lineup from Stubb’s BBQ begins at 7:45 p.m. CDT and is scheduled to include Fiona Apple, Andrew Bird, The Alabama Shakes, Dan Deacon and Sharon Van Etten. Thursday’s showcase from the Parish begins at 12:30 p.m. CDT and is scheduled to include The Magnetic Fields, Polica, Sugar Tongue Slim and La Vida Boheme. Check ’em out at the NPR Music website. Read all of Popdose’s in-depth coverage of SXSW 2012 at this here fancy link.